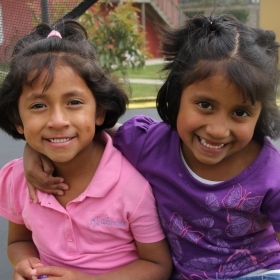 Oasis is a community of family-style homes for Guatemalan girls. At Oasis, the Kids Alive staff works with government authorities to provide a safe haven for girls who have been rescued from dangerous environments. These girls are in court-ordered protective custody and all come with the deep scars of exploitation. Sadly, Guatemala ranks among the worst countries for violence against women and girls. Here the girls live in family units with Guatemalan Christian house parents. They attend school – many for the first time – and have access to trauma-focused therapy to help heal their emotional wounds. They receive legal support as they face custody hearings and criminal proceedings against aggressors. And most importantly, they are introduced to and surrounded by news of the transforming, healing love of Jesus. Within Oasis is a specialized program focused on caring for child-moms and their babies. “La Arquilla” provides specialized care to young girls, usually pre-teens, pregnant as a result of abuse, and also for their babies as soon as they are born. Typically arriving in crisis, these traumatized girls receive excellent medical, nutritional, and post-partum care as they navigate life simultaneously as a child and a mother. They receive all the normal Oasis services, as well as the benefit of onsite day care for their babies while they continue their much-needed education. Casa Ester is a program born from a need to provide safe transitional housing for girls who grew up at Oasis. Although our legal responsibility may end when girls reach 18, our spiritual and moral responsibility is still alive and well! Located on a separate campus in San Lucas, Casa Ester provides supervised independent living. A young lady from Oasis must have a life plan and letters of recommendation in order to enter the program, where she will learn important life skills and receive ongoing Christian discipleship. In this safe, supportive atmosphere, young women continue their education, practice independence, and learn spiritual dependence on Jesus to guide their futures. Oasis is a ministry that lives up to its name – providing love, care, and the water of Life to girls being rescued from the desert of abuse – and it’s a great location for Service Teams and missionaries to serve! Support the Ministry of Oasis Residential Home with Your Gift Today.